I felt like I had to do something after Hurricane Katrina. I guess I could have done lots of things like volunteer my time to help the refugees -- but I didn't*. I decided to get myself a motor-generator so I could run the lights, microwave oven, and the refrigerator if/when something like Katrina comes thru my neighborhood. I'll jump to the chase. I bought a Honda EU2000i, a quiet, 2kW generator that should do the job. A much smaller unit would work to run just lights but to start up a refrigerator you need near 2kW capacity. My 20 cu-ft refrigerator runs at around 3A but the starting surge is 15A or so. 1) Turn off the house MAIN breaker -- light company power could come on any time and cause havoc if I'm still hooked to the generator. 2) Fire up the Honda. 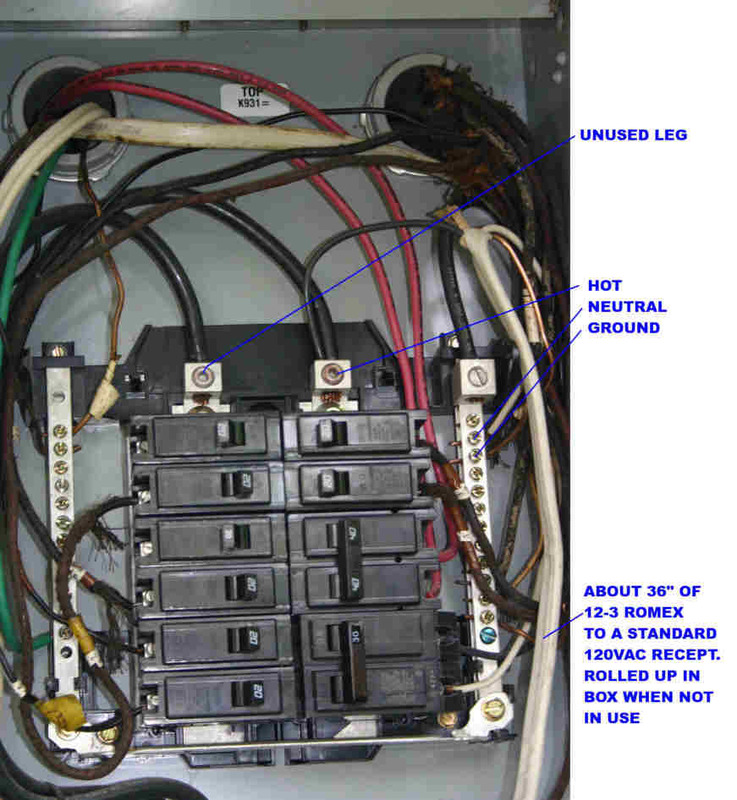 4) Switch off all the breakers to unused circuits -- so one can't turn on something the generator can't handle. 5) Plug the other male cable end into the 120VAC receptacle on the Honda while it's running. 6) Go inside and turn on the lights, refrigerator, microwave, etc. and enjoy the hurricane aftermath as best as possible. Ignore pleas for cold drinks from your neighbors. This Honda has two operating modes: The first mode runs at full speed with the full 2kW available but it runs only about 4 hours on the 1.1 gallon gas tank. There is a 'eco' switch on the unit which allows it to run much slower, and quieter, delivering a few hundred watts, and in this mode it will run 15 hours. When larger currents are needed (like when the refrigerator tries to start up) it will rev up to supply whatever is needed -- up to its 2kW limit -- and ramp back down to low speed when the big load is gone. While on mains power, I put a clamp-on current meter on the refrigerator power line and saw a short, big spike that looked above 20 amps when it started. Question: would my 2kW Honda, running in the very efficient, slow 'eco' mode be able to rev up in time to get that fridge started? The answer is yes. While on the Honda in 'eco' mode, I watched the ammeter while the fridge started up and saw the current hang at about 16A (the current limit set internally in the Honda inverter block) for a good second or so-- and finally it dropped down to the running current of just under 3A. The fridge was running fine. Of course the lights and microwave worked fine too. Disclaimer: don't try this at home. If you do, don't blame me if it all goes to hell. * OK, I made what I consider a substantial donation to a local church that was helping folks displaced by Katrina. Update, Hurricane Ike: We were on vacation during Ike. Got home two days afterwards (with some great difficulty) and found some large limbs in back yard but the power was on! 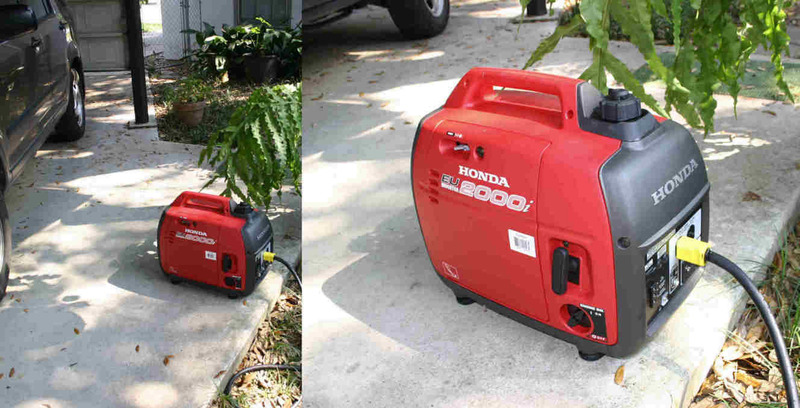 We loaned the Honda generator to a friend who really needed it. It ran for about 250 hours and got near the advertised 15 hours/gallon in Eco mode. It ran his fridge, washing machine, and the motor on the gas dryer. He kept it and bought me a new one.